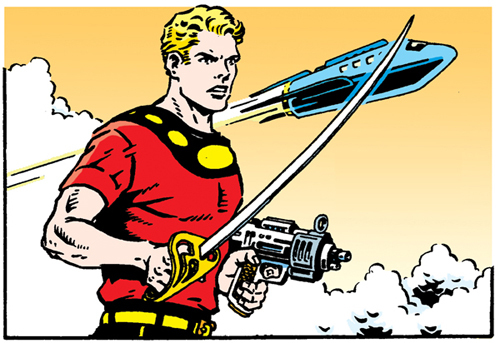 As many of you may know, King Features has been re-releasing the run I did on Flash Gordon over at Comics Kingdom. The strip that recently ran on January 6, 2019 originally ran July 25, 1999. Back then the cameo was President Bill Clinton. When it ran again on December 4, 2011 it was with President Obama. For January 6, 2019 it would be President Trump – but with all the recent talk about “Space Force” and “Space Command” I thought it would be interesting to actually quote Trump from an article that ran in the Business Insider. The editors at King made the observation that this could possibly appear as if I was trolling Trump supporters, so it was decided to tweak the dialogue a little. And also the hands seemed to be drawn a little small – so maybe tweak that as well. The one thing I couldn’t change (as Sundays have to be in a month and a half before they run) is the drawing of Secretary of Defense Jim Mattis next to Trump. Mattis gave a letter of resignation in December with his last day scheduled for the end of February, but then Trump decided to dismiss him as of January 1 (just five days short of when this Sunday saw print). Granted with how crazy the news cycle is these days, nothing that’s a month old is timely in today’s world. And there you have it, a little peak about what goes on behind the scenes on the Flash Gordon comic strip. I hope you enjoyed it. • Has Flash warned the the people of Earth in time to save them from Ming’s impending attack? •Will Dale and Zarkov escape Ming’s clutches in time to stop Boston’s impending doom? • Is there a Queen video that can answer these questions and more?! Stay tuned to Comics Kingdom to find out! This entry was posted in Flash Gordon and tagged President Clinton, President Obama, Trump. Bookmark the permalink. Well, that was weird…had to laugh during the Queen clip from the movie. I did see the original movie when it first came out…the music soundtrack fit perfectly. The whole thing was so campy…a perfect mix of cheesy effects and ham-handed action. Very 40s and 50s looking. Jim Keefe’s art is perfect for the comic strip. Does it still run somewhere? Maybe in newspapers in some of the “Stans” in Central Asia. Keefe’s artwork is probably the only thing that keeps that strip alive…in whatever galaxy it thrives in. Nice work, Jim! I thought the Trump hands were the right size and the dialog was perfect in the first one. However, his calling for something that doesn’t exist in the second one s also perfect. That said, loved that you shared these. Thanks! And a shout out to King Features for being onboard with this.